The Twitter Help Desk App allows companies to automatically generate tickets on UVDesk whenever any customer (Twitter user) creates a tweet in respect to one of the channels (Twitter Mentions) added by a company through the app. This provides companies with an extended ability to interact with customers on Twitter directly through the existing helpdesk system. A user mention, or simply username, is how you’re identified on Twitter, and is always preceded immediately by the @ symbol. A hashtag mention, or simply hashtag, is any word or phrase immediately preceded by the # symbol. The Twitter App works by listening to a topic of interest to your Company from Twitter Live Feeds and creates a ticket for every new tweet relevant, providing you with an instant medium to communicate with your customers on Twitter, right from your helpdesk. Whenever a ticket is created from twitter feeds, a new customer account will be created for the Twitter User if it’s their first tweet in context of the application. It should be noted that it’s the responsibility of the company agents interacting with the user to provide them with a login URL to access their account. 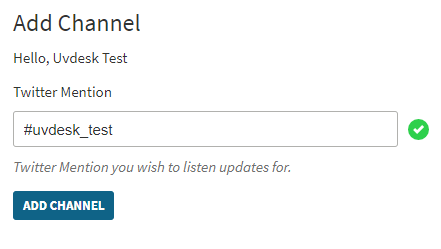 How to add a channel to Twitter App on UVdesk? When you install the Twitter App, Go to Configure tab to Add New Channel. Authorize your Twitter account with UVdesk for the successful login. Once the authorization is done, you need to prove the name of twitter mention for which you are looking for updates and Save it. How to recognize a ticket on UVdesk coming from a Twitter account? 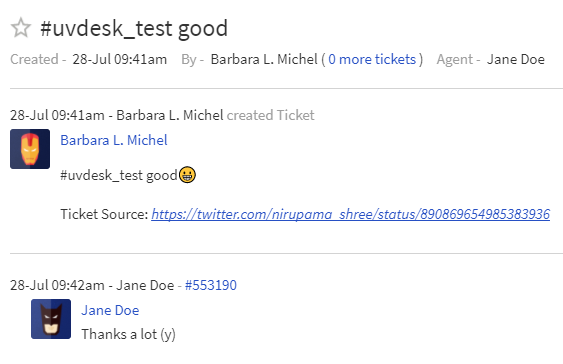 Whenever a ticket comes to UVdesk from any Social or Utility tools, you can find the source of the ticket from the Ticket Source URL mentioned on the ticket. 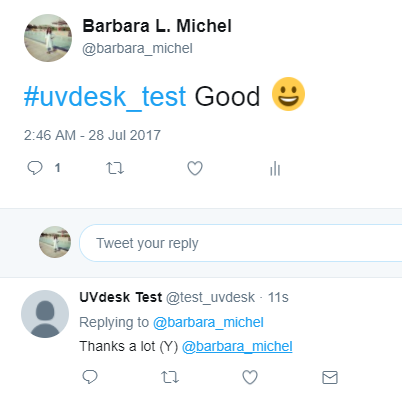 How can I reply to a tweet directly from UVdesk? By integrating Twitter App with UVdesk, whatever tweet is done using your hashtag, a ticket is generated on UVdesk dashboard. By replying to the same ticket, your reply is posted on the same tweet on Twitter.